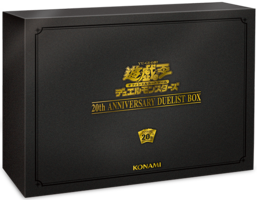 20th Anniversary Duelist Box is a set in the Yu-Gi-Oh! Official Card Game. 6 20th Secret Rare promotional cards. 6 Special Packs. Each pack contains 3 Ultra Rares and 3 Normal Parallel Rares. 1 of 6 Duel Fields. 1 of 2 20th Anniversary Edition cards made in stainless steel. 6 Extra Secret Rare promotional cards. This page was last edited on 4 March 2019, at 18:18.